If you have questions about any of our products, questions about an order placed or require technical support please contact us. RadTech products are available online, by phone or fax and at many retail locations throughout the world. The RadTech web store accepts major credit cards and PayPal payments from over 200 countries and we ship to any destination on Earth. Orders shipping to the following countries must use PayPal as the payment method when purchasing from the RadTech web site, (you can email us for other possible options: ) Ghana, Indonesia, Mauritius, Morocco, Nigeria, Romania, Tunisia, Turkey and Vietnam. Payment methods accepted: American Express, Discover, MasterCard, Visa, PayPal and TT (wire) transfer. Credit Card info required: Type of card, account number, Exp. date, name on card, billing address and CVV2 (security) code. All prices are quoted in US dollars. Merchandise, product specifications, availability, imagery and prices depicted are subject to change without notice. Items designated as Clearance, Closeout or Final Sale are drastically marked down and are not eligible refund or exchange unless defective. Prices in effect at the time of order placement will apply. Clients who provide incorrect shipping data will be responsible for all costs related to retrieving and/or reshipping the order. RadTech works hard to ensure that every item we offer is in stock and available for immediate shipment. Most orders ship within 24 hours of being placed - In the rare event that an ordered item remains unavailable to ship after 72 hours have elapsed, RadTech will inform clients via the email address entered on the checkout page order form. Items which specify an ETA, or expected ship date (typically pre-order and backordered items) are date listed as accurately as possible. In many cases, RadTech relies on estimated in-stock dates from third-party vendors and suppliers. Please understand that we do our very best to provide the most accurate estimates possible with the data available to us, however, delays beyond our control do occasionally occur, which is precisely why we list these ship dates as expected - please plan accordingly. In an effort to minimize fraud, your credit or debit card's issuing bank, and/or the card's payment processor (American Express, Discover, Mastercard, Visa) may require that we contact you to verify your identity and/or to confirm that the card being used is in your possession. Typically we are required to obtain a photocopy or facsimile of the card, and one form of a government-issued photo ID These documents are securely destroyed immediately after a verification or non-verification is determined. Changes or modifications to customer orders may be done at anytime prior to shipping - EXCEPT if a 'gift' credit card was used for payment. Gift credit cards are the purchasable variety that do not bear a card holders name. Be aware that any changes or modifications to an order will result in a second authorization, sometimes called a Pending Charge, on the card holder's transaction record. The first authorization, posted to the account at the original order amount, will expire in 2 - 30 days depending on the issuing bank's policy regarding authorization expiration. In other words, if you modify an order after it has been placed on our web site, you'll see a line item on your transaction record that represents the original order amount - this is not a charge, it's simply an authorization that occurred when you placed the original order and it will vanish in a few days. The amount of this temporary authorization will not be available on your credit card account until the authorization expires. Simply add item(s) to the shopping cart - enter postal code & country, and the least expensive shipping option is displayed. Click Checkout and you'll be presented with several shipping options, including next-day delivery, 2-day service, etc. We automatically display the appropriate carrier options for PO, APO, FPO, DPO boxes, dock doors, etc. NOTE: Order's must be placed by 14:00 (2:00 pm) US Central Time (GMT -6) to ship same day - barring any fraud checks mandated by the credit card merchant services bureau, or your card's issuing bank. Purchaser is responsible for any duties, taxes, handling fees, etc which may be imposed by country of residence and/or delivery service providers. Choosing a USPS (postal mail) shipping option usually results in significantly less, or no duties or taxes. Emailed shipping notifications cannot be recreated if undeliverable - creating an account however, will allow you to view your order history and tracking data anytime. Quoted ship times are supplied by third-party carriers (US Postal Service and FedEx). RadTech is not responsible for shipper's performance - shipping fees cannot be refunded if deliveries are late. You may however, receive a refund or adjustment from the carrier if you inquire. For orders shipping outside the US, please note that selecting the "suppress prices on packing slip" option only hides the pricing on the packing slip inside the box. Border Customs requires that a commercial invoice, with pricing specified, be attached to the outside of the box for their inspection. Therefore, the suppress prices option will not reduce or eliminate any required duties or taxes that might be imposed by your country or region. For home deliveries, make sure that a friend or neighbor hasn't accepted or retrieved the package on your behalf. If you've shipped to a facility with a mail room, or if deliveries are not normally made directly to you, check with your mail room or receptionist. Purchaser is responsible for all costs related to incorrectly addressed order submissions. RadTech is obviously not responsible for Custom's delays. Clients shipping orders to Brazil and Mexico are strongly encouraged to use a FedEx shipping option. Postal shipments bound for these countries as well as Russia are uninsurable and therefore no guarantees can be made regarding successful deliveries. Countries exhibiting unusually slow postal ship times averaging 3-4 weeks. In rare cases, up to 6 weeks: Belgium, Canada, Italy, Portugal, Russia (this does not apply to orders shipped via FedEx). Orders shipping to the following countries must use PayPal as the payment method: Ghana, Indonesia, Mauritius, Morocco, Nigeria, Romania, Tunisia, Turkey and Vietnam. Any shipping dates or times provided are approximate. Conditions may arise which prevent compliance of delivery schedules, RadTech shall not be liable for any damage or penalty for delay in delivery or the failure to give notice of the delay. RadTech shall not be liable for delay by reason of inability, due to causes beyond its reasonable control, to obtain the necessary labor, materials, or manufacturing facilities, or for delay due to the elements, acts of nature, acts of the purchaser, acts of non-performance of suppliers, acts of civil or military authorities, fires, floods, epidemics, quarantine restrictions, war, riot, strikes, accidents due to machinery, delays in transportation, or any other causes beyond the control of RadTech whether or not similar to the foregoing. In such event, delivery dates shall be deemed extended for a period equal to such delay. Purchaser is responsible for all costs related to incorrectly addressed order submissions. If a shipment is returned to us "undeliverable as addressed," client is responsible for any return to sender fees (FedEx only). Incorrectly delivered items will be replaced by RadTech, including all shipping fees, if reported within 15 days of receipt. Items must be returned in like-new, sellable condition, with all product packaging and pack-ins intact - returns missing packaging or pack-ins will be subject to an item-specific reconditioning fee. Exchanges for client mis-ordered or for color changes are allowed for most items if reported within 15 days of receipt, and received within 30 days. And only if item and package are in like-new condition - reshipping fees will apply. Client must contact RadTech to arrange payment for shipping exchanged item(s). Client damaged or altered returns are not refundable or exchangeable - items received by RadTech damaged or altered will result in the client being notified, and given the option to purchase shipping to have the item(s) returned to them. Item(s) must be returned in like new condition with all components and packaging intact and undamaged. Pack returns well to avoid damage in transit - items and packaging damaged in transit are not eligible for full credit - returns missing packaging will be subject to an item-specific repackaging fee. Opened HDDs, iPod/iPhone service parts, Ice Creme Kits, Bezel Blaster Kits, Glide Kits and ClearCal Protective Films can be exchanged for same, only if defective. If you believe an item you've received is defective, please phone or email our Product Support Dept: +1 877-777-9088 x106 (Monday - Friday, 9am - 5pm US Central Time) / with a description of the problem. Defective product replacements will not be shipped until the original item is received and tested. Once the item has been confirmed defective, and all components are accounted for, the replacement item(s) will be shipped. If the item is being returned for credit, the credit will not be issued until the item has been inspected, tested and confirmed to be defective. Returned items which are found to be free of defects (not defective) will result in the client being contacted with options for disposition. To return an item which you simply do not want, but is otherwise free of defects: Allowed for most items if reported within 15 days of receipt for refund or exchange. Item(s) must be returned in like-new condition with all components and packaging intact and undamaged. Pack returns well to avoid damage in transit - items and packaging damaged in transit are not eligible for full credit - returns missing packaging will be subject to an item-specific repackaging fee. Opened HDDs, iPod/iPhone service parts, Ice Creme Kits, Bezel Blaster Kits, Glide Kits and ClearCal Protective Films can be exchanged for same, only if defective. Shipping fees are non-refundable. In the event you wish to cancel an order which has been placed, call: +1 877-777-9088 (leave a message if after hours) or email: ASAP. If the order has already shipped, simply return the merchandise to the RadTech mailing address listed above once received. Include a brief note detailing the reason for return, and whether a refund or exchange is desired. Include the name and/or order ID from the original invoice. Please insure, or require delivery confirmation on your return to avoid any issues. Product refunds will be issued via credit to the payment vehicle used. All credits will be transacted within 48 hours of receipt of returned goods. Shipping fees are not refundable. Only products purchased directly from RadTech can be returned to RadTech - unless defective and returning for warranty service or exchange. Return product and all components, postage paid, and in original packaging, to the RadTech mailing address listed above. Include a brief note detailing the reason for return, and whether a refund or exchange is desired. Include the "ship to" name and/or order ID from the original invoice for proper credit - items returned without adequate ID are impossible to process and will be held for 30 days. Items remaining unclaimed after 30 days will be donated to a charitable organization of RadTech's choosing. Please insure, or require delivery confirmation on your return to avoid any issues. Product refunds will be issued via credit to the payment vehicle used. All credits will be transacted within 48 hours of receipt of returned goods. Shipping fees are non-refundable. Item(s) must be returned in like new condition with all components and packaging intact and undamaged. Pack returns well to avoid damage in transit, insurance is strongly recommended - items and packaging damaged in transit are not eligible for credit. 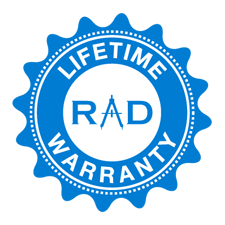 All RadTech-branded products are backed by a lifetime warranty against defects in materials and workmanship, when used under normal conditions for the task they were designed for, to the original purchaser. Proof of purchase is required for warranty claims. Normal wear and tear and/or abuse is not covered, and RadTech reserves the right to determine if an item is eligible for repair or replacement under this warranty. Some third-party products offered by RadTech carry shorter, or manufacturer-specific warranties, see the specific product page for warranty details and warranty service procedures. Other warrantee rights may be accorded to you, which vary by country, state or province. RadTech does not warrant that any product will meet a client's requirements, or that the operation or use of any product will be uninterrupted or error-free. Client damages will be limited to return of the purchase price or license fee even if RadTech has been advised of the possibility of such damages, or for any claim against client by another party. All defective products are repaired or replaced at the discretion of the manufacturer. Please contact the manufacturer should you experience a problem with a non-RadTech manufactured product. For the phone number of the manufacturer, please refer to the included product documentation. Note for computer, iPod and iPhone accessories, cases, sleeves and service parts: While RadTech makes every effort, including extensive group testing, to ensure that all iPod and computer accessories and cases will not cause any harm, scratching, staining, undesired operation, susceptibility to electrical or RF interference, etc. It is impossible for us to conceive of, or to test for, every possible scenario or situation which our clients might encounter. Therefore, we make no warrantees whatsoever, and shall not be liable for: iPod or computer surface and/or case scratching, cracking or staining. Problems of an electrical nature, including short-circuits, opens or RF emissions or interference. Or failures or breakage of lanyards, hinges, latches and locking mechanisms, etc. Opened and/or installed Hard Drives, Protective Films and Service Parts can be exchanged for same if defective. Note for ClearCal Protective films: Check film for proper size by test-fitting on screen or device before removing protective mask. In addition, check film thoroughly for any creases or other damage before removing protective mask. Once protective masks or liners have been removed, films are not returnable, exchangeable or refundable. Note for Glide Kits: Due to the inherent nature of slowly deteriorating mechanical notebook computer components, RadTech shall not be liable for component failures which manifest during or after use of Glide Kit tools or the application of Syndrol metal conditioner. Client damages will be limited to return of the purchase price, once the failed components have been inspected by RadTech, and the contents of the Glide Kit(s) purchased are returned.